Over the years, I’ve been asked innumerable times why Anchor Brewing chose to use the “Type G” keg coupler instead of the standard “American Sankey.” In 2017 Anchor finally transitioned to the standard 15.5 gallon “American Sankey” kegs, but up until then, our beer lived in fairly uncommon kegs. It’s an interesting bit of Anchor history that I’d like to explain. 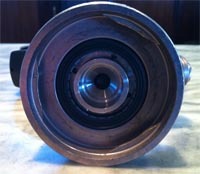 The “Type G” keg coupler (left) and the “American Sankey” coupler (right). 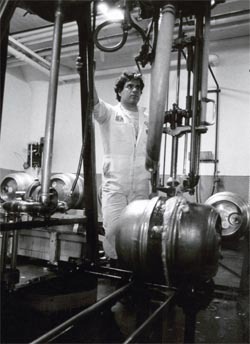 Anchor employee Bruce Joseph filling Golden Gate kegs circa the 1980s. Prior to the mid-1970s, there were many different types of keg couplers in use in the USA. The most common was a system known as the Golden Gate. This involved two separate valves: one on the top for CO2 inlet, and one on the bottom for beer outlet. Golden Gate was used prior to Prohibition on wooden kegs and remained in use on the metal kegs that were brought into use thereafter. These post-Prohibition metal kegs were designed to be cleaned, filled, and otherwise handled using the old racking equipment that every surviving brewery still had on hand. There was no other reason for those kegs to be shaped like they were. Likewise, there were a large number of taps still available as well. Golden Gate was old, if not sturdy, technology, but the industry was looking for a single-valve alternative. Some breweries developed proprietary taps, others used a variety of old and new – the Hoff-Stevens two-prong tap and the Olympia being examples. The European breweries, which did not have to deal with Prohibition, developed their own types. Anheuser Busch, at the time the largest brewery in the USA, used the Golden Gate tap and began to convert to the newer style kegs with the American Sankey around 1975. They began their conversion in the East and moved across the country in stages. This resulted in a huge number of surplus Golden Gate kegs ending up in the West. This was a huge blessing for the emerging craft brewers who had access to an almost unlimited supply of good kegs at scrap prices. Anchor was among them, having used Golden Gate since the 1890s. By 1987, or thereabouts, even our old racking equipment was in dire need of replacement. We were about to make a major investment in kegs because we were planning a national draft rollout. Here’s where it gets interesting. Following the lead of Anheuser Busch, all of the major breweries quickly followed suit. Everybody’s kegs looked the same. As one of the few, if not only, small craft brewers operating in the draft space with breweries many times our size, it was incredibly important that our kegs stand out, so they would not be accidentally absorbed into the giant infrastructure of the mass brewers. 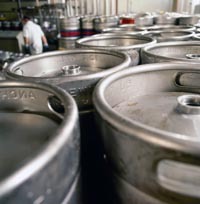 In the brewing industry, there’s a phenomenon called the “float,” which refers to the number of kegs you have to have either in inventory, at a wholesaler (whether empty or full), in an account, or somewhere in transit, for every keg tapped up to a faucet. The float is normally ten or twelve to one but can get as high as twenty to one if your empties don’t return in a timely manner. With new kegs then approaching $100 each, we obviously wanted to get them turned around as quickly as we could. We knew that they would get sorted out and returned eventually, but we needed to refill them more than just once or twice a year! The decision was made to make them just different enough so they would stand out a bit in the float and not be misdirected to another brewery before we got them back. The Type G coupler connects the beer line and faucet to a 50-liter keg of beer. Meanwhile, the Europeans had developed their own couplers, and we chose the one now known as the “Type G” because it was widely used by many breweries, especially in England. Furthermore, the Type G was already being used over here by Bass Ale and a few other popular draft imports, so the coupler was available. Also, in 1985, there was beginning to be a shift to metric-system packaging of beverages, and we thought that we could be in the vanguard for the beer industry in this regard by using a European standard 50-liter keg along with the Type G coupler. We succeeded in that we did get a quicker turnaround on the kegs. We were also in the vanguard of metric keg packaging in the US beer industry. Imported draft comes in metric kegs, so we were not alone in this. As for the Type G coupler, European taps never quite caught on here. Interestingly enough, a few of the most popular European imports now use the Sankey or a variant thereof instead. Over 30 years later, due to a standardization in the American brewing industry that spans both large domestic breweries to microbreweries, in 2017 Anchor eventually made the switch to the standard 15.5 gallon “American Sankey” kegs. Assuming you take all the necessary safety precautions: the short answer is yes. You’ll need to make sure that your CO2 inlet fitting has a pressure relief valve, as many of the early versions did not. Do all of your beers, including Anchor Summer, use Type G couplers? Yes, all of our beers in the larger kegs (which are 50L or 13.2gal) use the Type G couplers. All of our beers in the smaller kegs (which are 5.16gal) use the American Sankey though.